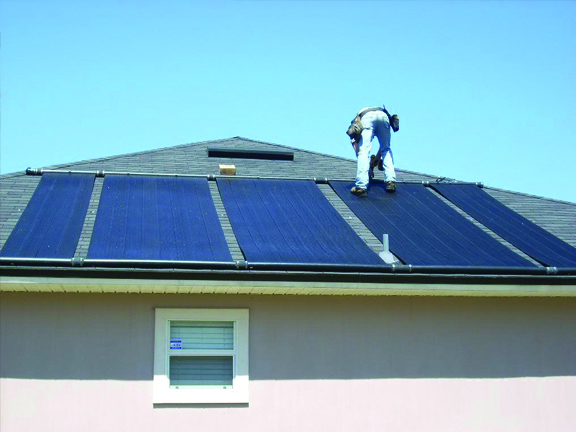 Installation of a Solar Industries Solar Pool Heater is simple, and takes an average crew of two about a day to complete. 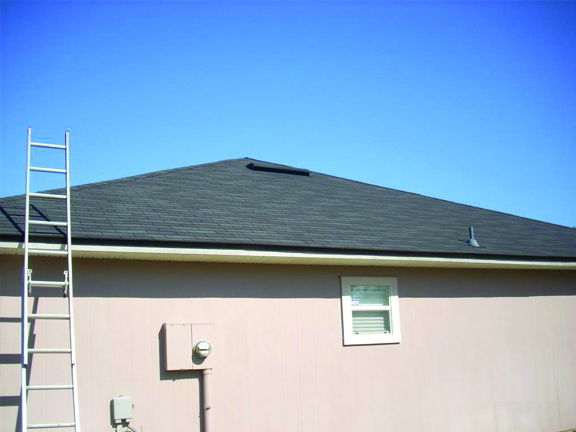 Solar pool heating collectors are generally installed on the roof, but can be placed anywhere that receives a good deal of sunlight (6-8 hours each day). Your Master Dealer will have already determined your specific solar pool heating system size, location, and configuration upon arriving to your home on your scheduled installation day. Solar Pool Heating Systems are mounted using heavy-duty stainless steel hardware and polypropylene-coated stainless steel strapping. The lightweight – yet durable – solar collectors are carried to the roof one-by-one as another member of the crew prepares the various hardware and fittings that will be needed in just a short while by the roof crew. 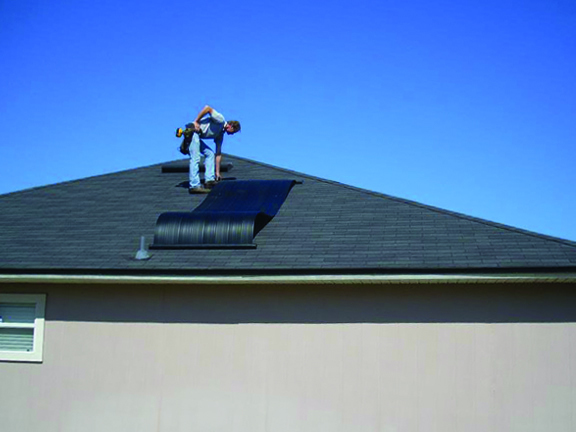 Once the solar collectors are on the roof, the swimming pool heating system starts to take shape as the installer connects the collectors together using special -dual-durometer- EPDM rubber couplers. Like every component of your new solar pool heating system, these couplers are designed specifically for this application. In fact, the National Sanitation Foundation (NSF) has tested our collectors and fittings to ensure they will not rupture, burst, leak, or sustain permanent deformation at over twice the maximum rated working pressure at 140 degrees F.
While systems can be operated manually, most solar heater pool owners prefer the worry-free luxury of an automatic controller. 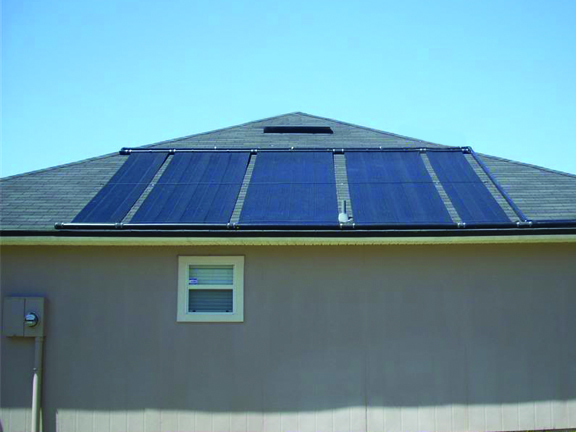 An automatically controlled solar system works on the same principal as your home's thermostat. Simply set your desired high-limit temperature, and pair of sensors (one measures the temperature the roof while the other measures pool water temperature) will determine when to turn the system on and off. 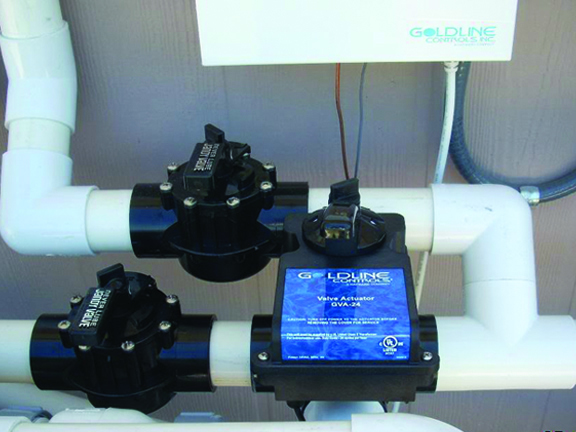 The system control then relays the information gathered by the roof and pool water sensors to a motorized three-way valve, diverting pool water from its normal circulation to the solar collectors. As water moves through the solar collectors, it will absorb thermal energy (heat) from the solar collectors before returning to the pool via the existing return lines. When pool water reaches the desired temperature set by the pool owner, an actuator in the three-way valve turns again and water circulates through your equipment as usual. 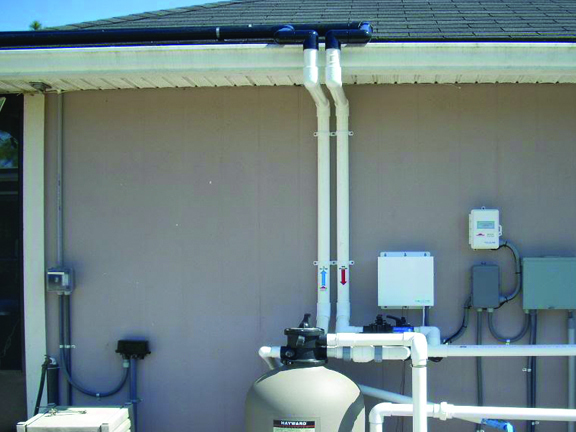 Schedule 40 PVC pipes and fittings are used to integrate the swimming pool solar heater system into your existing pump and filtration system. Although PVC pipe is generally white, black is also available (as shown) but may be difficult to find locally. 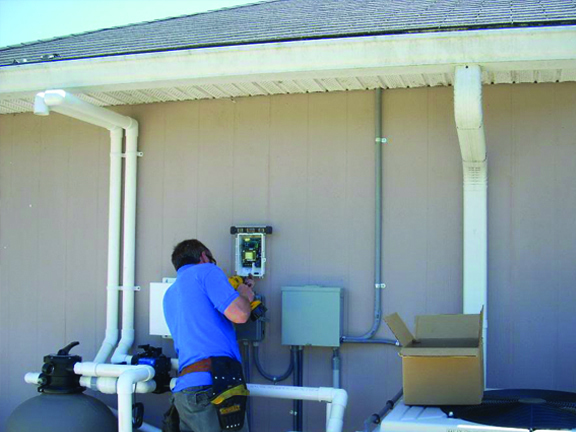 In order to ensure a properly metered flow of water through the solar pool heating system, the installer will plumb the solar system to fill (or feed) from the bottom inlet header of the solar collectors; heated water then flows back to the pool from the top outlet header. Since the sun is shining, your Solar Industries Solar Pool Heater starts to work the moment the system is turned on. Within just a short time you'll be able to enjoy your pool for all its worth, just as you had originally intended. So relax, and enjoy the warm and luxurious comfort of your own heated pool – without the expensive utility bills.